Come down on Thursday 12th and support the occupation through food & film. There will be dinner ready for everyone from 7pm. From 8pm we’ll be screening “Si Se Puede”, preceded by some of the short documentaries classic series “Regen-Degen” & followed by Q&A with someone from PAH Barcelona and footage from the Aylesbury on-going occupation. From the beginning of the economic crisis in the year 2007, an estimated 550,000 foreclosures have been initiated in Spain. Given local and national government’s passivity to this acute housing situation with 184 evictions per day, civil society has been forced to organise. 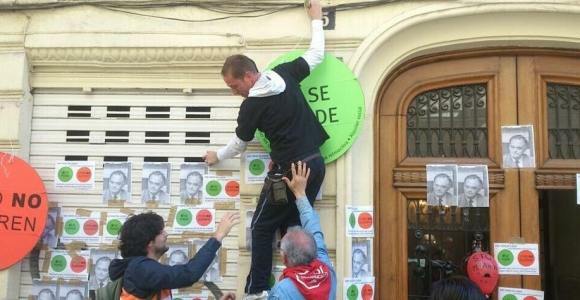 In 2009 the PAH, the Platform for People Affected by Mortgages, was established in Barcelona as a citizens’ movement for the right to housing and in response to a housing emergency. Since then, it has been fighting to secure the right to adequate housing and today is one of the largest social movements in Spain counting over 200 local sections, 1135 stopped evictions and 1180 people rehoused. This film is a daily account of Barcelona‘s Platform for People Affected by Mortgages. It portrays what a common week, and its tireless activities, could look like. It placed cameras at the heart of the organization to depict not only the post-housing bubble drama but most importantly the huge work behind the PAH and the deep process of transformation and empowerment of those who participate in it.